Exciting and hip New York style loft with 12' exposed wood ceilings and a motorized glass 'garage' door that opens to a tiled patio with verdant garden views. Its ideal location near the rear of the building allows for complete tranquility. 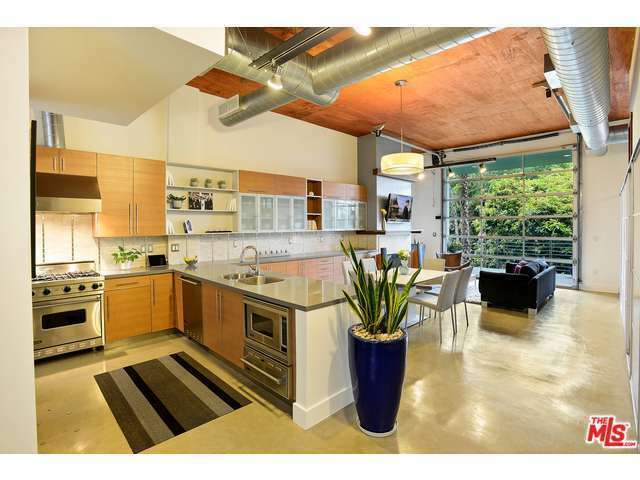 Meticulously maintained, the unit features polished concrete floors, built in custom cabinetry & a stylish fireplace. There are sliding panel doors separating the 2 in-suite bedrooms. The Master features a beautiful custom closet system. The sumptuous tiled bath is separated from the room with a dramatic wall of glass and features a spa tub, separate stall shower double sinks & dual vanities. The second bedroom also has custom closets and a dramatic glass dividing wall to the beautifully tiled bath. The gourmet kitchen is open to the living space and features Viking appliances, beautiful countertops, tiled backsplashes and ample cabinet space. This is your perfect base to explore everything West Hollywood has to offer! Selling Office: Rodeo Realty Inc.